A garden classic that's stood the test of time! 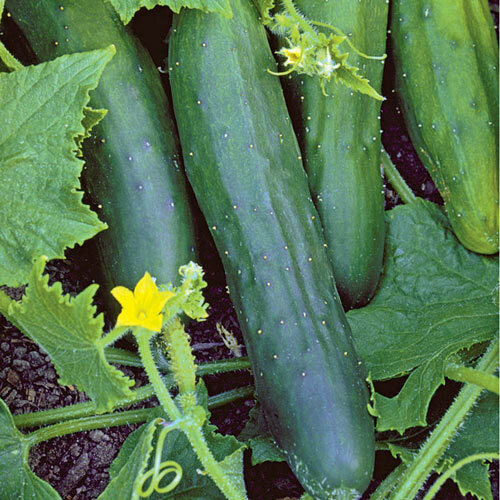 Sweet Marketmore Cucumber bears heavy yields of straight, block-like, smooth fruits with dark green skins and white flesh. Cukes have a very small seed cavity, tender skins and a sweet, mild flavor. Prolific 4-6 ft. vines consistently produce fruits. It's no wonder Marketmore is one of the most widely grown slicing varieties! 60-75 DAYS. FruitStraight, block-like, smooth fruits. Dark green skin with a white flesh. Seed CountAbout 25 seeds per packet. CommentsVery vigorous. Small seed cavity. A very heavy yielder. An All-American selection in 1935. Free from stippling. Sweet and mild. Size8 inches long x 2.5 inches in diameter.